Ages 8 through 17. Build oral language and verbal reasoning skills as children define words, describe characteristics of nouns, events, and situations, and make comparisons, The activities are perfect for students with word retrieval problems and children who have difficulty using vocabulary effectively to convey information. The complete kit includes a full-color game board, playing cards, markers, and an instruction booklet. Set A - Compare and Explain. The student is presented with two words and is asked to describe how the words are the same and how they are different. The student is then asked to create a question about each word. Many of the items relate to volcanoes and other natural disasters. Set B - Words with Similar Meanings. The student is presented with a sentence that contains an underlined word. This sentence is followed by a list of three words. The student's task is to select the word that is closest in meaning to the underlined word in the sentence. Set C -Answer the Questions. The student is asked to respond to questions about specific topics and questions about word meanings. Set D - Describe or Explain. The student is asked to describe or explain each of the situations presented on the playing cards. This game comes in a durable storage box that is easy to transport without damaging the game. 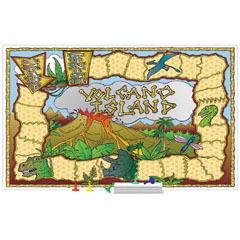 Like all games published by Academic Communication Associates, Volcano Island was manufactured in the USA.